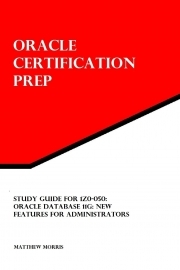 Description of "Study Guide for 1Z0-050: Oracle Database 11g: New Features for Administrators"
This Study Guide is targeted at Oracle Database 10g Administrator Certified Professionals who are looking to upgrade their certification or Oracle 11G. The book provides information covering all of the exam topics for the Oracle upgrade exam: "1Z0-050: Oracle Database 11g: New Features for Administrators". Reviews of "Study Guide for 1Z0-050: Oracle Database 11g: New Features for Administrators"